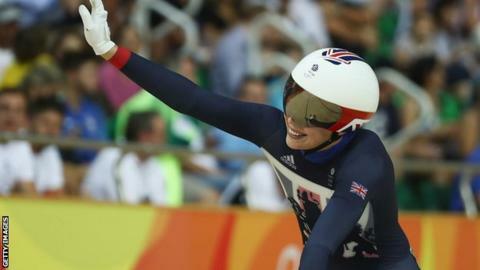 Double track world champion and Olympic silver medallist Becky James has retired, at the age of 25. The Welsh athlete won the world sprint and keirin titles in 2013 and took silver at the same events at the 2016 Rio Olympics. "I have had time to think about my future and have decided to retire from international track sprint racing," James said in a statement. She intends to set up a baking business "along with exciting other projects". James has been plagued by injuries during her career, and suffered a cancer scare in 2014 when she had an operation to remove abnormal cells following a cervical screening. She first made a mark when representing Wales at the 2010 Commonwealth Games in Delhi, winning a silver medal in the sprint and a time trial bronze. After taking her world titles in Minsk, James faced a battle with illness and knee injuries before qualifying for Rio 2016. She took a break after Rio, and told BBC Wales in July 2017 that she was excited about getting back into full training. However, in a statement posted on her Twitter account on Wednesday, James said she was grateful for her success but that it was time to move on. "After 13 years of racing my track bike, it is time to start an exciting new chapter in my life. I have given cycling 100% and know how much commitment it takes to make it to the highest level in elite sport," she said. "The pressure of competing at the top can be mentally and physically draining, but the rewards have been incredible and I have absolutely no regrets! "I have achieved my dreams of becoming a world champion, a Commonwealth medallist for Wales and becoming a double Olympic silver medallist. "I now want to enjoy my life without the strict training regime, while at the same time continuing to lead a healthy lifestyle both in body and mind. "For a long time I've had a passion for baking and have loved making special wedding and birthday cakes for friends and family ... and it's my intention to now pursue this passion as a business, along with some exciting other projects going forward."